Click the link below to read the review and see the rating! The last few days have been chaotic, as I had to leave Korea earlier than I anticipated as I had to return to Canada ASAP to attend a funeral. I originally had a 2.5 hour connection in Osaka Kansai Airport so I could have enough time to clear immigration in order to sample the new Chicken burger at Japanese McDonald's but my ANA flight to KIX was delayed, so I didn't have enough time. 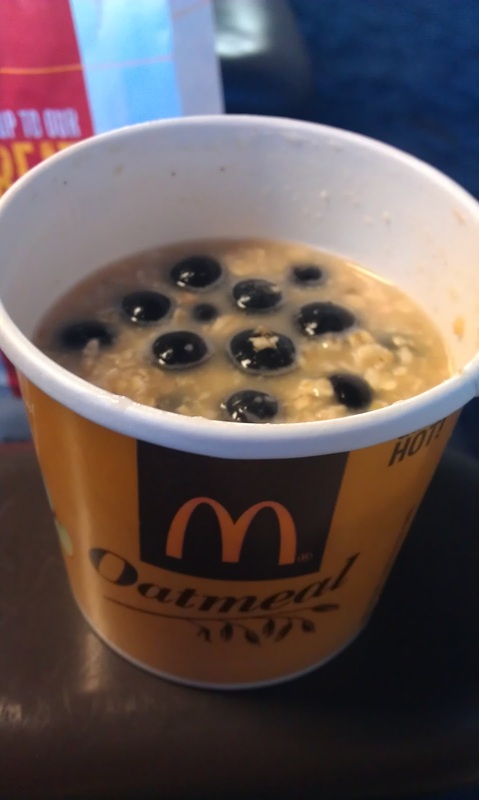 Though a rerouting put me to fly through Chicago and I was able to sample the new Blueberry Banana Nut Oatmeal at the American Airlines terminal of ORD. 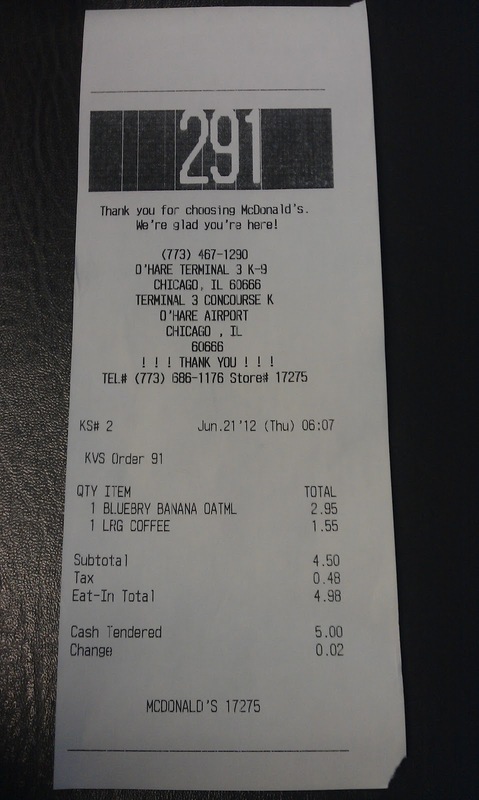 McDonald's in the US introduced Oatmeal back in early 2011 (see my review of the original Fruit and Maple Oatmeal here. The promotional Blueberry Nut variant did sound appealing and I was looking forward to trying it. Its presentation looked pretty good, and it had a strong cinnamon smell coming from it. Though I remembered the original one being somewhat larger, and at first, I thought they didn't use very many blueberries, but once I stirred the oatmeal around a few times I noticed that many more were hidden below. The blueberries looked fresh, and they were all pretty large. Though when I tasted it, all I could taste was the cinnamon, not the blueberries, not banana, not nut, just cinnamon. Now, if this was any other day, I would have given the oatmeal a 1/5 and been done with it, but this time, I think it was not the foods problem, but mine. 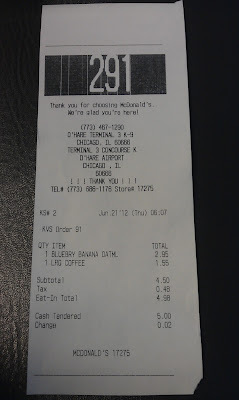 When I sampled this item, I had been awake for over 36 hours, and I was very stressed that I would be back in time for the funeral (my original flight was cancelled, and I had to make 3 other flights in order to get back in time), I had flown 6 flights in the last 30 hours, and I needed sleep. I think I need to sample this again to give it a fair rating. Therefore I will give this a temporary 1/5, and I will post an updated review in a couple of days after I try it again.